Avant-garde Digital Movement or “Digital Sublime” Rhetoric? With 25.5 % of voices obtained at the 2013 parliamentary elections in Italy, the MoVimento 5 Stelle (M5S or Five Star Movement) has become a central actor of Italian politics. The Movement relies to a large extent on a vision of Internet-driven and -based direct democracy; as such, social media have been the main organizational tools behind its rise of the past few years. 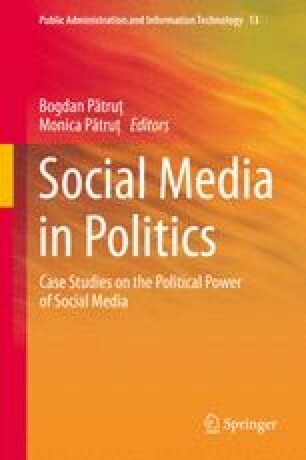 At the same time, it is argued that the power of networking, the allegedly egalitarian approach to public debate, and the horizontality of relations typical of social media are not, in fact, the backbone of the Movement, but a primarily discursive device destined to hide the importance of much more “traditional” political instruments of hierarchical authority and opaque management of financial flows, and to legitimize the amateurism of the movement along with its anti-political drive. This chapter provides a portrait of the digital and social “vision” posited by the Movement—its practical, organizational consequences alongside its narrative(s). It aims at showing how the different components of this vision all contribute to the M5S’s status of new force to be reckoned with in the Italian political space—not always, and maybe not primarily, for the reasons the Movement itself provides. Italian comedian Maurizio Crozza impersonating a puzzled Giorgio Napolitano, President of the Italian Republic, April 2013. The members of the Institute for the Study of Diplomacy, School of Foreign Service, Georgetown University, have provided helpful comments on earlier drafts. I am grateful to Patrizia Galletti Musiani for her patient constitution of an impressively complete dossier of Italian press articles on M5S in the spring of 2013. Casaleggio, G. (2012). Ho scritto io le regole del MoVimento 5 Stelle. Il Corriere della Sera, 30 May 2012. http://www.corriere.it/politica/12_maggio_30/casaleggio-regole-mov-5-stelle_9e8eca9c-aa1a-11e1-8196-b3ccb09a7f99.shtml Accessed 8 Nov 2013. Diamanti, I. (2013). Il partito autobus dei Cinque Stelle. La Repubblica, 18 March 2013. http://www.repubblica.it/politica/2013/03/18/news/diamanti_cinque_stelle-54795281/ Accessed 8 Nov 2013. Morozov, E. (2013). Morozov e la ‘retorica Web’ del M5S (interview with Raffaella Menichini). La Repubblica, 5 March 2013. http://www.repubblica.it/politica/2013/03/05/news/intervista_morozov-53835572/. Accessed 8 Nov 2013. Musiani, F. (2013). Governance by algorithms. Internet Policy Review, August 2013. http://policyreview.info/articles/analysis/governance-algorithms. Accessed 8 Nov 2013. Pepe, A. & Di Gennaro, C. (2009). Political protest Italian–style: The blogosphere and mainstream media in the promotion and coverage of Beppe Grillo’s V–day. First Monday, 14(12). http://www.firstmonday.org/ojs/index.php/fm/article/view/2740/2406. Accessed 8 Nov 2013. Ruggiero, C. (2012). Forecasting in the politics of spectacle, from Berlusconi to Grillo: The narrative of impolite politics. Bulletin of Italian Politics, 4(2): 305–322. http://www.gla.ac.uk/media/media_264086_en.pdf. Accessed 8 Nov 2013. Tisch, J. (2010). Active citizenship: A new approach to volunteering. Huffington Post, 27 April 2010. http://www.huffingtonpost.com/jonathan-tisch/active-citizenship-a-new_b_553417.html. Accessed 8 Nov 2013. Valentini, G. (2013). La grande illusione della web-democrazia. La Repubblica, 13 April 2013. http://giovannitaurasi.wordpress.com/2013/04/13/la-grande-illusione-della-web-democrazia-di-giovanni-valentini-da-la-repubblica-del-13-aprile-2013/. Accessed 8 Nov 2013. Valenza, D. (2013). Le Mouvement 5 Etoiles en Italie: un parti ‘anti-système’? Nouvelle Europe, 23 April 2013. http://www.nouvelle-europe.eu/le-mouvement-cinq-etoiles-en-italie-un-parti-anti-systeme. Accessed 8 Nov 2013.